St lowering springs seat leon cupra / r 1p 2, 0 tfsi year fab. This product page has been automatically translated. If you have any questions, do not hesitate to contact us. For more than 20 years of experience of listening. Large selection of tuning brands. Many parts free shipping option only in Germany. Auto spare parts & accessories. How to find the number of hsn & tsn! New car registration the 2.1 & 2.2 age pinks fields 2 & zu3. 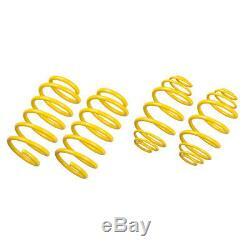 St springs lowering springs seat leon cupra / r 1 p 2.0 tfsi 09 / 09. St springs sport the wide range of springs and suspensions account with over 1,000 applications for the few lowering springs on the market to improve in combination with the standard suspension maneuverability of a vehicle. In addition to an attractive lowering of license suspensions and lowering of springs to increase cornering speed and dynamic driving. Class optics for a car the open sky chrome silicon steel made with cold rolled st suspensions lowering springs are multicoated and publish a final epoxy coating. What they hold the most diverse weather stand. When installing suspensions st lowering springs lowers compared to the standard suspension not only the body's center of gravity, but also the dynamics benefited. With strong steering movements, such as in avoidance maneuvers and fast turns are reduced due to the low curvature of body movements. In addition, the reduction of compression and relaxation, resulting in a more agile behavior. The ideal spring rate for each lowering spring sports spring suspension rates in perfect harmony with the damper vote of the series. Finally, the st have spring lowering suspensions in connection with the respective weight of the vehicle, the wheel load and the level of the features offered lowering a huge impact on the entrances and rebound of the chassis of the series. Made of chrome-silicon steel sports suspension springs not only support the weight of the vehicle, but also guarantees specially calibrated spring rates, a more direct driving experience. Depending on the degree of lowering, for example, a reduction in the concentration of 20 mm, 30 mm or 40 mm, sports suspension springs have spring rates that are combined with series shock absorbers. The lower the level of lowering, the lower the spring rate. Compatible with the following vehicles: vehicle: seat leon cupra / r (1 p) 2.0 tfsi power in kw: 177-195 year: 09 / 09- lowering front / rear: 20/20 mm axle load goes: -1050 kg / ha: -930 kg notes: with a part of lopinion art. Please check before buying on the constraints in the vehicle list to find your appropriate spare parts. To ensure optimal tuning and avoid erroneous deliveries, please use the vehicle application list above and enter your vehicle identification number hsn / tsn. If you can always contact us and find us the right springs for your car. You will find this information in your vehicle, registration papers under the following numbers: manufacturer number column number 2.1 enter the column number 2.2. France postcode areas are included in the delivery: 97133, 97150, 972xx, 973xx, 974xx, 971xx, 97500, 976xx, 986xx, 987xx, 98799, 988xx (guadeloupe, saint-barthelemy, saint-martin, martinique, french guiana , meeting, saint-pierre and) miquelon, mayotte, wallis and futuna, french polynesia, island of clipperton, new caledonia we do not deliver in regions with postcodes: 97133, 97150, 972xx, 973xx, 974xx, 971xx, 97500, 976xx, 986xx. Martin, Martinique, Guadeloupe, French Guiana, The Meeting, Saint-Pierre-Saint-Pierre-and-Miquelon, Mayotte, Wallis and Futuna, French Polynesia, Audio Island Clipper, New Caledonia). Great Britain postcode areas are included in the delivery: in the (Isle of Man), gg (guernsey), I (Jersey), we do not ship for the following postcodes: in the (Isle of Man), gg (guernsey), I (jersey). Italy postcode areas are included in the delivery: 23030, 22060 (livigno, champione 'd italia), 47890 47899 (san marino) the seguenti zone di postal code sono exlus dalla consegna: 23030, 22060 (livigno, champione' d italia), (san marino 47890 47899). All shipping information pertains to payment and apply exclusively to the continent. Save this seller as a favorite. Tieferlegen, prokit, sport-line, pro-kit, sportline, sportfahrwerk. The item "tilting springs seat leon cupra / r 1p 2, 0 tfsi year 09/09" is on sale since Wednesday, March 28, 2018. It is in the category "auto, motorcycle parts, accessories \ auto \" spare parts \ suspension, steering \ subframe ". The seller is "aze_hammelburg" and is located in bayern. This item can be shipped to the following country: europe.